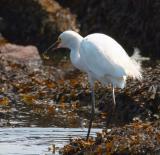 These birds let me get close and they continued to feed--a first time for the egret. I used a canon 100-400 f/5.6 IS lens for most of the shots. The remainder were with a canon 70-200 f/2.8 IS lens. All shots were hand held.